Family farms remain an essential feature of agriculture in the United States. Family farms make up 99 percent of America’s 2.1 million farms and 89 percent of agricultural production. Most farms in the United States are small: 90 percent are small family farms that operate nearly half of America’s farmland. However, farms vary widely in size and other characteristics. U.S. farms range from very small retirement and residential farms to businesses with sales in the millions of dollars. To help the public better understand the U.S. farm sector, USDA’s Economic Research Service (ERS) released America’s Diverse Family Farms: 2016 Edition. The report categorizes farms into groupings based on several factors: the annual revenue of the farm, the primary occupation of the principal operator, and ownership of the farm – family or nonfamily. Annual revenue is measured by gross cash farm income (GCFI), the sum of the farm’s crop and livestock sales, Government payments, and other farm-related income, including production contract fees. While only 24 percent of the Nation’s agricultural production was attributed to small family farms in 2015, they produced more of two commodities than midsize or large-scale family farms: poultry and eggs (57 percent)—mostly under production contracts—and hay (52 percent). Together, midsize and large-scale family farms accounted for 65 percent of total U.S. agricultural production, but only 9 percent of farms. 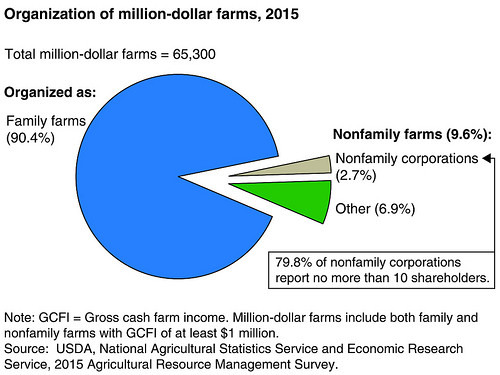 Nonfamily farms (1 percent of farms) account for the remaining production (11 percent). Since 1991, agricultural production has shifted to million-dollar farms—those with GCFI of $1 million or more, measured in 2015 dollars—including both family and nonfamily farms. In fact, million-dollar farms now account for half of all U.S. farm production, up from a third in 1991. When you think of farms that large, you may not think of family farms. However, most million-dollar farms (90 percent) are family farms. Only 3 percent are nonfamily corporations, most of which (80 percent) report no more than 10 shareholders. 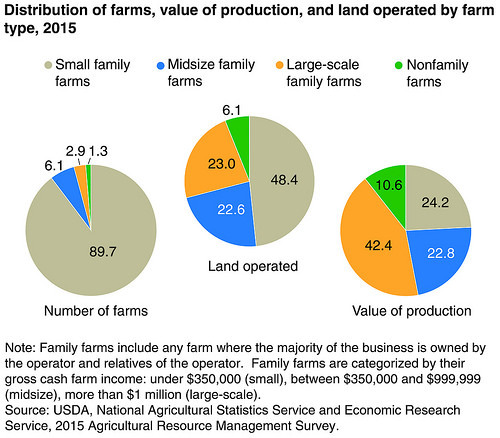 In short, small family farms dominate the farm count in the United States, while midsize and large-scale family farms dominate production. America’s Diverse Family Farms reveals that family farms are still central to our agricultural economy. For more information, please see the archived webinar on America’s Diverse Family Farms.